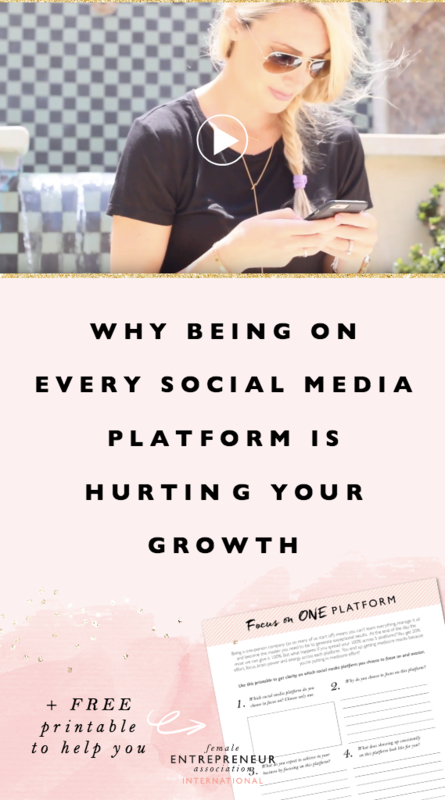 So many aspiring entrepreneurs start out thinking that in order to grow your business and your audience, you need to be on every social media platform and trying every growth strategy. It makes sense in theory that the more places your business is exposed to, the more people will find you. However the reality is somewhat different. Being a one-person company (as so many of us start off) means you can’t learn everything, manage it all and become the master you need to be to generate exceptional results. At the end of the day, the most we can give is 100%. But what happens if you spread your 100% across 5 platforms? You get 20% effort, focus, brain power and energy across each platform. You end up getting mediocre results because you’re putting in mediocre effort! You fall into this trap where you think you’re on the right track to building a wildly successful business, but the result is often that the actual growth doesn’t match the effort or expectation. You end up feeling stuck, frustrated, or worse yet, burnt out and ready to throw in the towel. I this week’s video I share why being everywhere and doing everything might be hurting you rather than helping. When you look at the successful entrepreneurs within your industry that have achieved amazing growth and continue growing every day, it’s very likely they started with one platform, one strategy or one project at a time until they mastered it and moved on to the next thing. The time will come when you can hire employees to manage certain tasks or platforms for you and let me assure you, behind every business you see everywhere online is a team of specialists often managing one or a small set of tasks. When I first started I focused on one platform, which was Facebook. This has now grown to almost 700,000 fans that love what I do. I’m sure I wouldn’t have achieved results anywhere near this had I stretched myself across Facebook, Pinterest, Instagram and Twitter when I first started out. I achieved a level of mastery at one thing that allowed me to generate the results I wanted. I’d love to know – are you struggling to create content for all the social media platforms, and trying every strategy you come across? Have you ever thought about focusing on one thing at a time and putting all your efforts into that? Let us know in the comments below.